Got lots of questions about this one at work today. 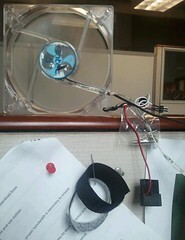 I ripped a 120mm fan out of a desktop and wired it up to an old usb cable. At 5v instead of the 12v it would run on normally it's no vornado; but it's helping since the AC is out here today. Edit: Hmm, except that it seems to have resized it on upload... unless I only shot it at vga quality. That will bear some inwestigation. Edit2: Ah hah! Cropping in phone crops to the actual pixels show on the phone.